The Best Remedy for Hemorrhagic Ovarian Cyst. About the Author: the writer has been practicing in homoeopathy for more than twenty years and at present; he is busy in tackling very serious cases those are, either being referred to the big and costly hospitals of the capital or set aside declaring them incurable. Many a case of uterine fibroid and other growths, malignant or benign have been cured with homoeopathic remedies. The writer claims that homoeopathic medicines may decidedly cure even the cancerous growths until the biopsy has been done. In his own views, the biopsy is never favourable to the patient because it is not a treatment, but merely a check-up against malignancy whether it exists in the particular part or not. In contrary, biopsy may, sometimes, become much harmful to the patient, when the infection that creates malignancy gets a way to come out of its limited area and spreads out through blood stream into other parts of the body. According to the writer so many patients are still alive and living a normal life, whom he suggested not to go for biopsy before he treated them. Mrs. Quresha, 35, much tired of her ailment came to my clinic with her husband and told me all about the problem created in her lower abdomen where she felt, all the time, a sharp burning and stinging pain that usually extended across hypogastrium to groin and then traveled downwards. 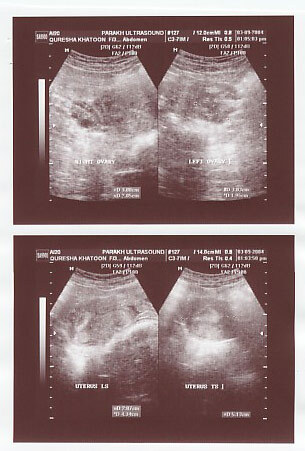 Besides it, she was suffering from smarting sensation in the urethra and a certain amount of tenesmus was present there. 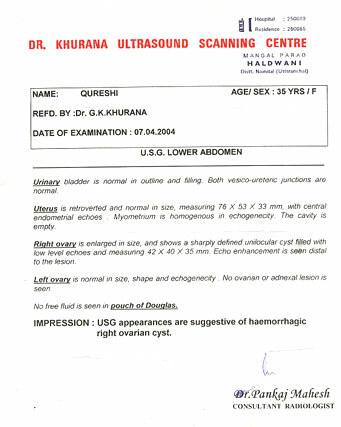 I glanced at the ultrasonic report, where the right ovary found enlarged in size having shown a sharply defined uniocular cyst filled with low-level echoes measuring 42 x 40 x 35 mm that was clearly mentioned ahead in the impression of the report as a haemorrhagic right ovarian cyst. They have three daughters and only son therefore, they are not anxious for next child, but Mrs. Quresha was not agree to be operated. However, the allopathic surgeons had warned her if she won’t be ready for operation, that haemorrhagic cyst might be likely to cause a serious injury. I took no much interest in her case after knowing the views of allopathic surgeons. “Why to take the risk in vain” I said to myself, and then told her about the clear-cut decision that I had taken. She laughed at me in an immoderate way as if, she was making fun of me, and giving a challenge to my job and ability, which I couldn’t bear and stood-up straight to face her challenge rigorously. It was, of course, an open challenge not only for me but also to homoeopathy, my mother, so I had to get down into the depth of symptomatic study of the case with some serious and solid steps. Soon I got some rubrics those proved very important keynotes to me, which made my task easy and I could overcame that bloody disease. The above rubrics noted down during investigation were sufficient to select a similimum for the patient; therefore, Lilium Tigrinum in 30potency was prescribed on the alternate day. Besides Lilium Tigrinum, no other remedy was given to her. Only placebo followed Lilium. Two week after the patient (Mrs. Quresha) returned and told me how she got most of her problems subsided. No pain, no other problem, from that day forth, reached such a severity, through which she had to pass now and then. There is no need to say that the patient had a great tendency towards healing-up. In the duration of two months, she looked so nice that every one was much surprised at her active and smart behaviour. Actually, the remedy Lilium Tigrinum proved a boon that gave her a new life. 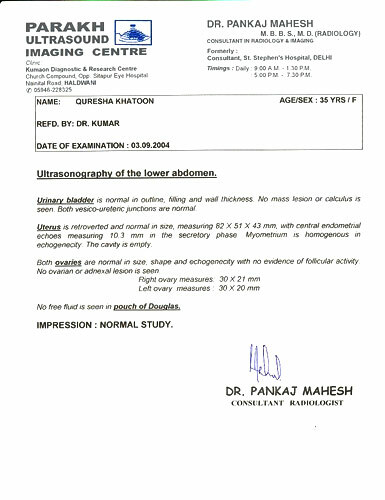 Mrs. Quresha came under my treatment on 13 April 2004 therefore, after the treatment of four months and a half; I referred her for ultrasonic revision that declared her quite O.K. giving a remark of normal study to the revision report. Mrs. Quresha is still under my treatment. She wants to be treated for some times more until she gets fully satisfied. The ultrasonic revision is being laid down as under.